Science has yet to so much as hypothesise a limit to Doom modding. There's Pirate Doom, Doom The Way Id Did, MSX Doom, Brutal Doom, Donkey Kong Country Doom, and now GoldenEye 007 Doom. Modder demo_the_doomer has set about reworking the '97 N64 classic as a GZDoom mod. The Dam level is apparently 75% done. 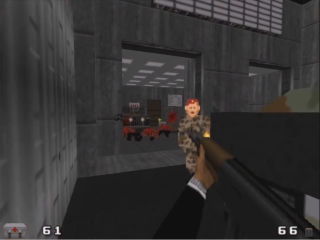 In the long term, the mod's not aiming to be a perfect replica but a re-imagining of GoldenEye to play at Doom-like speeds (and include more Bond one-liners). There's a short demo available if you'd like to perform some recon.